The sunchoke, also known as Jerusalem artichokes can be mistaken for ginger at first glance. The flavor is the furthest thing. Sunchokes are wonderful in soups, salads and even roasted in the oven. To read more about our Seasonal Chef‘s inspiration for this recipe click this link: Sunchokes are in Season! Sunchokes are harvested when the ground is cold. Look for them in the early Winter and Spring. They are a great addition to your soup and salad recipes. Scrub well and peel the sunchokes. Chop into 1” pieces, toss with a squeeze of lemon juice and set aside. Using the pale green and white parts of the leek trim, chop and rinse well. Saute with the butter and a good pinch of salt and pepper over medium heat. Cook for about 5 minutes. Add the fennel seed and cook for 1 minute more. Add the chopped sunchokes and cook for 5 minutes until the take on a translucent color. While the sunchokes cook peel and chop the pear. Add the broth and pear; bring to a simmer and cover. Cook for 10 minutes or until the sunchokes are soft. In a high speed blender puree the soup with the Half and Half and place back in the pot to keep warm. Taste for seasoning adding additional salt and pepper as needed. You can also adjust the thickness with a littler more water and creaminess with more Half and Half. 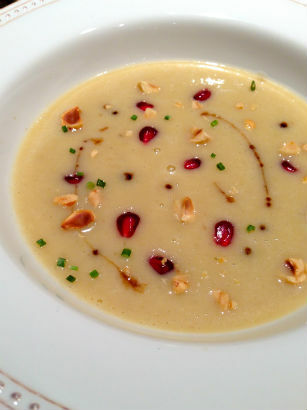 Serve garnished with a couple of pomegranate seeds, chopped hazelnuts, chives and a drizzle of a good thick balsamic. Rather than a heavily flavored vegetable stock I would suggest using a broth instead. You want to add a little flavor but not overpower the sunchokes. In cases like this I like to use the Organic No-Salt Better Than Bouillon Vegetable brand. Next Article Seasonal Chef: Sunchokes are in Season!